Just days ago, we announced the publication of the US edition of Nevada Days (Nevadako egunak, Pamiela 2013). Initial feedback and reviews are already out, and the book has been very warmly received and, for example, it has been included by The Millions in their Great Second-Half 2018 Book Preview. Graywolf Press published Nevada Days, translated by Margaret Jull Costa, at the end of June. This US edition follows on the heels on the UK edition, published last year. Atxaga began writing the book during the nine months that he spent in Reno (Nevada) with his family in 2007- 2008. Part chronicle and part novel, it won the Euskadi Prize for Literature in 2014, and shortly after publication in the US, we started seeing the initial reviews and feedback in the US press, for instance this one published in The Washington Post by Matt Gallagher (Reno, 1983). "Nevada Days serves as an inverse retelling of [Laxalt’s Sweet Promised Land], and through the precision of Atxaga’s language and the truths about Nevada and America he brings forth, it certainly meets the standard set by its predecessor. Its pages carry the smell of sagebrush and ring of slot machines, and will bring readers deep into its messy beauty. (...) A number of Nevadans have cultivated a proud literature over the years, from Clark and Robert Laxalt to more recent offerings by Claire Vaye Watkins, Willy Vlautin and Caleb S. Cage. Celebrated Basque author Bernardo Atxaga now joins their ranks. His genre-blurring Nevada Days neither loves nor scorns Reno so much as mulls it over slowly, deliberately." O Magazine and Fiction Advocate, for example, have included it in their "summer reads" lists, and The Millions in their Great Second-Half 2018 Book Preview. 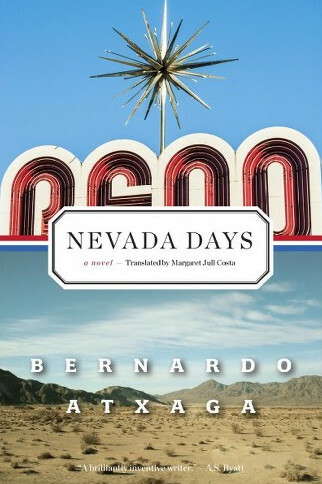 "Told in short, bite-size bursts of prose, Nevada Days manages the difficult task of being a convincing thriller where the plot is unfolding one door away from the presumed protagonist." "A foreboding, atmospheric slow burn. . . . The real genius of this novel is Atxaga’s unique blending of autobiography and fiction, of a piece with Karl Knausgaard and Ben Lerner". "[Nevada Days] takes a diary form, and thoughts, observations, and memories, bump into each other like buoys on the sea... Readers will smell the pervasive sagebrush and feel the lurking danger of the Wild West, a place where footsteps quickly disappear in the dry air and always shifting sand". "The sublime meets the surreal in this hypnotic blend of memoir and fiction by the great Basque writer as he explores Reno, Nevada, an outpost teeming with David Lynch–like menace and haunted dreams". "In real life, Bernardo Atxaga had a nine-month-long residency at the University of Nevada’s Center for Basque Studies. That experience provides the inspiration for this novel, which fictionalizes his time in Nevada and offers a glimpse of shifting landscapes, dislocation, and the surreal". "Atxaga's intriguing new novel, Nevada Days, is a marvelous melange that combines interwoven time- and storylines with journal-like entries, fiction, and memoir to create a literary effect at once entertaining and disturbing... Atxaga's powers of observation are as keen as they are concise. He lets spare language do the work other stylists can only envy... If Walter Van Tilburg Clark, who was actually born in Maine, captured the essence of 1940s Reno in his celebrated City of Trembling Leaves, a persuasive argument can be made that Atxaga has caught the strange, beautiful, and troubled spirit of the place during the first years of the new century".